Today I bring you a special A More Diverse Universe edition of Reading Notes: the following are all excellent books by women of colour that I’d like to draw your attention to. Coincidently, two of them are also Newbery Honor Books, and all three are National Book Award finalists or winners — a reminder that these are awards I should probably keep an eye on. 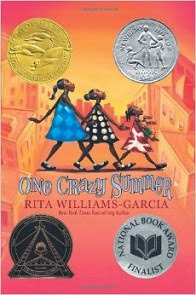 One Crazy Summer by Rita Williams-Garcia: This wonderful historical novel is set in 1968, a key year in the Civil Rights Movement, and it tells the story of three sisters — Delphine, Vonetta and Fern — who travel to Oakland to spend time with their estranged mother. Their mother, Cecile, left Brooklyn when the youngest of the three sisters was a baby, and became an artist and Black Panther activist in California. There are many reasons why One Crazy Summer is brilliant, but the main one is that it acknowledges both the validity of Cecile’s choices and the legitimacy of Delphine’s feelings of abandonment, thus allowing a complicated and multifaceted truth to emerge. This is pretty much my favourite thing for fiction to do, so chances I wasn’t going to love it were slim. My second contribution to Diversiverse will hopefully be a discussion of this novel’s sequel, PS: Be Eleven, and I’ll get into what makes William-Garcia’s writing so great in more detail then. Suffice to say for now that both One Crazy Summer and PS: Be Eleven were reminders of why I have so little patience for “children’s literature is simplistic” type arguments. These novels are historically rich, but in a way that never weighs down the narrative; they’re politically engaged in subtle but effective ways; they’re consistently nuanced; they challenge simplistic narratives about the everyday reality of fighting for racial and gender equality; and they’re immensely fun to read. It wasn’t at all the way television showed militants—that’s what they called the Black Panthers. Militants, who from the newspapers were angry first wavers with their mouths wide open and their riffles ready for shooting. They never showed anyone like Sister Mukumbu or Sister Pat, passing out toast and teaching in classrooms. For more on this novel, read Jodie’s excellent review at Lady Business. Poetry slows us down, cherishes small details. A large disaster erases those details. We need poetry for nourishing and for noticing, for the way language and imagery reach comfortably into experience, holding and connecting it more successfully than any news channel we could name. which means they will never understand the story. Which means it will go on and on. As I said back when I got this book, I had high expectations due to Shihab Nye’s poem “Gate A-4”. I’m happy to report I wasn’t in the least let down. 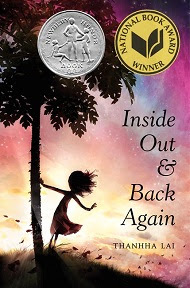 Inside Out and Back Again by Thanhha Lai: Lastly, we have a historical novel in verse about ten-year-old Hà, who moves from Vietnam to Alabama in the 1970s, during the Vietnam War. The novel is divided into four sections: the first focuses on Hà’s life before the fall of Saigon; the second on her family’s long boat journey to America; the third on their lives in Alabama, where Hà faces racist bullying at school, struggles to adjust to her new environment, and slow begins to feel at home in her new life; and the fourth and final one looks towards the future. Inside Out and Back Again is a quick read, but Lai manages to make Hà’s world feel fully realised. Through a series of key scenes and small but meaningful details, we get to know the emotional reality behind Hà’s experiences: her feelings about the home she leaves behind, her adjustment to the loss of her father, her struggles with the English language, what it feels like to go from the brightest student in her class to someone who’s routinely condescended to, etc. Lai combines humour and sadness to tell the story of a young girl’s transition to a new life. I liked the following scene, where for the first time Hà tells an adult (her neighbour Miss Washington) about the bullying she’s had to endure at school. By then she’s had reasons to begin to suspect that well-meaning adults are not necessarily infinitely powerful, but there’s still relief in knowing she doesn’t have to face this alone. when her eyes get red. and you can eat at your desk. Inside Out and Back Again, and One Crazy Summer are both books I've been meaning to read for some time. Now I'll be looking up 19 Varieties of Gazelle! I've always liked the poems I've come across by Naomi Shihab Nye, and now you've made me realize I've never looked for an entire volume by her; guess this is the one to begin with! I haaaaaave to read One Crazy Summer. I've had it on my list forever, and it sounds wonderful. Thanks for reminding me about it! I haven't heard of any of these, but I suppose that is not all that surprising! Those books all sound like great picks for a classroom. The excerpts are beautiful and touching. 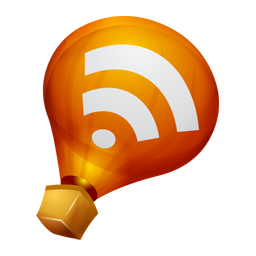 Congrats on posting 3 reviews! I really need to read ONE CRAZY SUMMER. It sounds fabulous, and Vasilly actually assigned it to me a few years back when we did a reading list swap, but I've always failed to get to it. Soon, I hope! 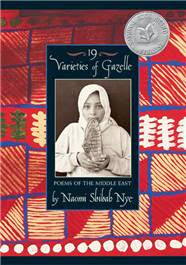 In the meantime, I plan to grab some of Naomi Shihab's poetry on my next library visit. My local branch doesn't have this particular title, but they do have a collection of her travel poems waiting on the shelf.